The book’s title is not misleading. The author not only means every word of it but will also substantiate his claim with strong evidences. Dr. Ezzat, supported by a serious community of scholars and their amazing findings, will reveal one of the biggest acts of deception in history responsible for fabricating the myth of Egyptian Pharaohs. And yes, the whole story of Egypt ever being ruled by so called Pharaohs is nothing but a pure myth and a blatant deception. The new evidence-based findings combined with the research carried out by the author of this book will help rid ancient Egypt of what otherwise seemed like a perpetual curse of (Jewish made) Pharaohs. Ancient Egypt was ruled by kings and queens, not Pharaohs. The king of Egypt had five titles none of them was Pharaoh nor sounded anything close to it. Get ready to think the unthinkable and imagine the never thought imaginable, for if Egypt knew no Pharaohs then it goes without saying that Egypt never Knew Moses either. And if Moses never set foot in Egypt, then The Exodus’ road map into the Promised Land has to be redrawn. Now take a deep breath, and try to digest that the Israelite’s Promised Land is not in Palestine where the modern day Israel has been established for nearly six decades now. How is that for a paradigm shift, pretty huge eh? Not only is the author going to stop this far but he is going to hit the readers with more explosive revelations such as neither Abraham nor Joseph ever set foot in Egypt or even dreamed about it. And if that’s not enough the readers will be in for a stunning surprise when they will find out that the true Pharaoh is not Egyptian and that he actually came from the arid and tribal land of Arabian desert. And that’s not all, brace yourselves for more astonishing revelations uncovering the Arabic roots of Judaism and where the Jewish Patriarchs Abraham, Joseph and Moses lived and died. 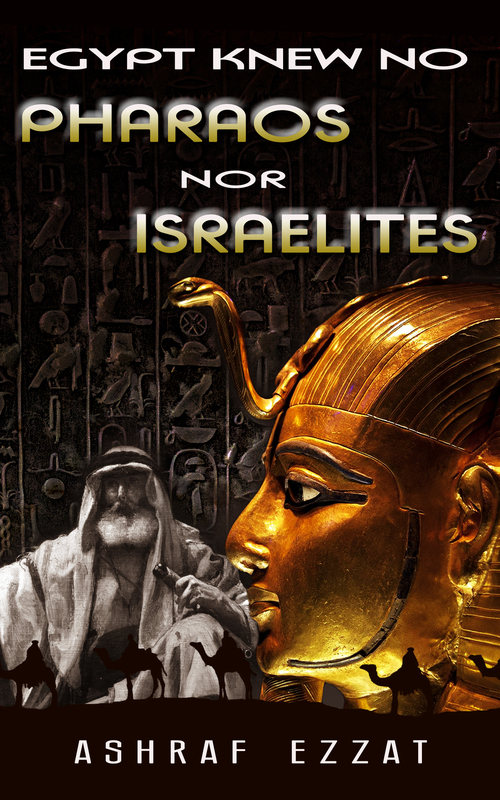 Still the biggest surprises this book will reveal is that ancient Egypt never witnessed any of the stories of the Jewish patriarchs and that the land of the Nile valley knew neither Pharaohs nor any Israelites. Egypt was never the land of the Israelites’ Exodus nor is Palestine their Promised Land. No matter whom you are, no matter what you do and no matter what your beliefs are this book is bound to change your view on life. Peel away a two-thousand-year deception and get ready to meet the truth, brace yourself for a rare encounter that will set you free. It’s quit natural Josephus was simply making it up because he could see similarities between several ancient tales, which the Bible pretty much does in so many ways. The Israelites were no rulers of foreign lands, since even minor entities left some kind of trace of their rule – Israelites did not. “In his Against Apion, the first-century AD historian Josephus debates the synchronism between the Biblical account of the Exodus of the Israelites from Egypt and two Exodus-like events that the Egyptian historian Manetho (ca. 300 BC) apparently mentions. It is difficult to distinguish between what Manetho himself recounted, and how Josephus or Apion interpret him. Josephus identifies the Israelite Exodus with the first exodus mentioned by Manetho, when some 480,000 Hyksos “shepherd kings” (also referred to as just ‘shepherds’, as ‘kings’ and as ‘captive shepherds’ in his discussion of Manetho) left Egypt for Jerusalem. The mention of “Hyksos” identifies this first exodus with the Hyksos period (16th century BC). Josephus provides the earliest recorded instance of the much repeated false etymology of the term Hyksos, as a Hellenised form of the Egyptian phrase Hekw Shasu, meaning “Shepherd Kings”. Scholars have only recently shown that the term derives from heqa-khase, a phrase meaning “rulers of foreign lands”. Apion identifies a second exodus mentioned by Manetho when a renegade Egyptian priest called Osarseph led 80,000 “lepers” to rebel against Egypt. Then, Apion additionally conflates these with the Biblical Exodus, and contrary to Manetho, even alleges that this heretic priest changed his name to Moses. Many scholars do not interpret lepers and leprous priests as literally referring to a disease, but rather to a strange and unwelcome new belief system. Josephus records the earliest account of the false but understandable etymology that the Greek phrase Hyksos stood for the Egyptian phrase Hekw Shasu meaning the Bedouin-like “Shepherd Kings”, which scholars have only recently shown means “rulers of foreign lands”. I’m really enjoying your work here and it’s what it’s all about, isn’t it? To explore the past because it’s a marvellous thing and as someone who went through the education system on Mid-East studies, the accepted chronologies and everything else that we learnt always put us in the position of to never question decades old theories. Some are correct, others we now know weren’t, but it’s always changing and we were always made aware to not stray too far into territory like what you are wonderfully writing. I found all of that disheartening because I could see clear issues even as a young student and while we may never know the true extent of much of this, the fact that we should be doing it is important. Would love to be interviewed by you! Currently on vacation but back soonish and just let me know what is good for you to chat. Keep up the great work and opening up new ways of thinking about the past – it’s much-needed. Apologies for not being able to reply in the thread, the reply button seems to be missing for RALFELLIS’ comments, so I’ll just write here. No, Pharoah was not used by the Egyptians and pr-3 was never used prior to ~1200BCE. This puts it hundreds of years after the term pr-3 was even used and when the Israelites were even (allegedly) in Egypt, not to mention that we’re assuming Pharaoh derives from the term pr3. If it was used for an actual “Pharaoh”, pr would be followed by a name, like pr-Daffy, just as an example, there was no Daffy from what I know back then. The Hebrew texts make it clear they are using the term to refer to a person, not a great house and certainly not in the example of the Queen of England which you used. Not being rude, but the context and the Hebrew is fairly clear we are looking at a person. This makes sense given the centuries after the event and the influence of Greek, Persian, Babylonian, Assyrian & Roman cultures, themes, etc. on the Jews after the Babylonian exile and certainly when the Septuagint was pieced together. Mt. Sinai was most definitely not a pyramid. The description in the Bible lacks all evidence pointing to Israelites describing a man-made monument. It’s describing an actual mountain or raised, natural formation. Linking the Hyksos is simply stretching things into the incredible. There is literally no evidence to link the Israelites to the Hyksos. The argument against them Israelites being the Hyksos are numerous, but one just has to look at the dates, cultural practises, etc. and the simple fact that nowhere and in no contemporaneous accounts does any people link Israel with the Hyksos – they are completely different entities. Now, that’s not to say an Israelite joined with later Hyksos, but that would be so minuscule in nature that it wouldn’t even bear any comment from historians. Josephus was wholly incorrect and apart from how we now know that many of his texts were manipulated by Christians after him. I don’t ignore the evidence because there is none. There is no Torah from the 6th century BCE. There is no evidence even remotely near the time of the Israelites to link them with the Hyksos in terms of culture and the massive impact they had on the region. If Israelites were ever nearly as great as the Hyksos, then why did they leave no mention of themselves and the term Israel not appearing for hundreds of years later as a minor “kingdom” in northern Palestine into parts of Lebanon? There is no credibility in the Hyksos being the Israelites and the data is so vast to demonstrate this. I see lots of conjecture and assumptions, but not only does it fall apart at the slightest examination, it simply fails as per what I said above. I don’t know any scholar who supports the Hyksos being the Israelites when the very small references to Israelites (contemporaneous to their time of existence) makes it clear they are distinct from any other group and not only that, but that they were a minor people and certainly never and at no time as great as the Hyksos. On the surface the thesis sits on two linguistic conundrums. a. That the title Pharaoh refers to a Great House and not to Egyptian kings, and it is not connected to the biblical title Faraon. As if the British queen cannot be both Queen Elizabeth and also the head of the Great House of Windsor. More importantly, the Torah never mentions ‘Faraon’ once. According to the Leningrad Manuscript, which is the oldest extant Torah in Hebrew, the name for these Egyptian kings is Faraoh or Pharaoh, without the ’n’. (He makes a big thing about the ’n’ consonant.) And the Torah mentions Pharaoh (without the ’n’) meaning ‘Great House’ on 268 occasions. I fail to see the argument being made here. b. That the biblical Misraim for Egypt is not the same as the Greek Aegyptos for Egypt, as if a land can never have more than one name. He then misses that Manetho says that the Greek name Aegyptos came from Pharaoh Ramesses-Aegyptos, who I equate with Ramesses I. And so Aegyptos is a later New Kingdom name for Egypt. And while the Aramaic Misraim may mean ‘fortress’, it is more likely to be derived from ‘misery’. The ancient scribes loved word-play, and to call Egypt the “Two Lands of Misery” was quite fitting. The Israelites were, of course, said to have suffered in Egypt and been kicked out of Egypt, so it is no wonder they had another name for Egypt – that land that could not be mentioned had just been deleted from history. So there is no reason to locate Faraoh(n) or Misraim in the Arabias, no reason at all. This is merely cultural revisionism, which is typical of Islam – everything is co-opted into being Arab and Muslim even when it has no connection whatsoever. Like the Koran saying that Abraham and Moses were Muslims – they just did not realise it. But if the author had thought more laterally, instead of trying to prove that the Israelites were really Arabs, he might of noted that the primary sacred site for the Israelites was a very tall, sharp, yet seemingly small mountain with a cave inside it (for god) and a black pavement on one side. And if the truth be known, then Mt Sinai was actually the Great Pyramid of Egypt. Problem solved, and the Israelites were most definitely in Egypt at this time. And if the author had researched Egyptian history more carefully (he is, after all, Egyptian), he would have noticed that the Hyksos Exodus out of Egypt is exactly the same as the Israelite Exodus out of Egypt. And he would have also noticed that Josephus Flavius says that the Israelites were indeed the Hyksos Pharaohs of Egypt. Which is why one of the Hyksos pharaohs is called Yakob(a), the biblical Yakob or Jacob. So again the Israelites were most definitely in Egypt at the time of the Exodus. In which case this attempt at cultural revisionism – saying the Israelites were Arabs – falls flat on its face. Instead, they were the Hyksos pharaohs of Egypt, and there are several books out there that prove this as a fact. Try Tempest & Exodus. A) I think you’re missing the point of the name “Pharaoh” -n. It’s of Greek origin and thus the later Hebrew Bible scribes simply appropriated the term. the argument being made here, I think, is that the ancient Egyptians during the supposed existence of Hebrews and later Israelites never used the term “Pharaoh”. Egyptian scholars will apply the Egyptian hieroglyph Pr-3 as meaning Pharaoh b u acknowledging they don’t know how it was pronounced. Thus, the definitive usage of the name in the context of the Hebrew Bible writers is relying on Greek sources, which further demonstrates the influence of Greek thought, names, philosophy, as well as other nations’ stories, on the Jewish writers. This reinforces the notion that the Israelites were never in Egypt. B) Assyrians, Neo-Assyria, Babylonia had several names for Egypt, but none were Misrayim. We assume names like Masu an such like referred to Egypt, but the evidence is lacking. To use Josephus’ works as evidence of an ancient Israelite exodus out of Egypt is simply staggering in the sheer lack of evidence. To associate the Hyksos with Israelites is simply ridiculous, since the weight of evidence of the Hyksos makes the Israelites look like a bunch of tribes, which is exactly what they were back then – a confederation of tribes of unknown origin. The Egyptian inscriptions of the Shasu and Israelites in Egypt (if it does actually point to Israelites), then it portrays them as a nomadic people who were decimated. There is no mention of Israelites conquering, invading or even having anywhere near the level of influence on Egypt as the Hyksos, so the theory that the Hyksos “exodus” was actually the Israelites is a non-starter. You also have to cite any references to Israelites being in Egypt on the scale you’re talking about, which I know is non-existent. Coming back to Josephus, there’s also the factor of time between the events and his writings. What I see is a simple case of Jewish writers creating a history for varied reasons during and after the Babylonian exile, which makes sense given that they were just one of many taken into captivity. In fact, they weren’t Jews then, but Judahites. Israel was practically long gone by then given the political wars between Israel and Judah. Then there’s the question of clearly Arabic names in the Hebrew Bible and the locations of some of the stories. In summary, it seems like there’s been a massive recreation of history on the Jewish part, and in all fairness, many cultures do that, which given their presence throughout the Mid East, it’s not surprising they combined, rewrote, reinvented and invented much of their “history” prior to the Babylonian exile. This leaves us with a perfectly reasonable assumption that Israelites could have come out of Arabia. We know that Yahweh was of Arabian/Egyptian origin and also Yemeni. The Egyptian connection to yahweh could be explained via the northern Arabian tribes venturing into Egypt or via Yemen into Egypt. And if we’re to trust the Bible, then we simply have to refer to Avraham, who clearly (not historically, since I don’t believe he existed), came out of Arabia (Southern Iraq, which was classed as Arabia by empires such Babylonians, etc.. Did his descendants pass on Arabian tales? Thank you, Mr. Ezra Halevi for your insightful comment. I’m turning my book into a documentary and would like very much to interview you (via Skype). If that’s OK with you, then we could expand further on the confusing issue of the Israelites and the Hyksos. The word for pharaoh is Egyptian, not Greek. Per-aa, meaning ‘Great House’, which became the Aramaic Par-oh, meaning ‘Great House’ according to the 1906 BDB dictionary. Just like we still have the House of Windsor for the UK royalty. Thus the derivation of the Egyptian ‘pharaoh’ is derived from Israelite Aramaic sources, which go back to the Egyptian era in question. Actually, to use Josephus’ account is insightful, not staggering. Josephus records came from the oldest Torah in the Temple of Jerusalem, which went back to the 6th century BC. They are some of the oldest records we have of the Egyptian era. And Josephus, who is Judaism’s greatest historian, said that the Israelites were the Hyksos – he called the Hyksos ‘our people’. So if Josephus believed that the Israelites were the Hyksos, why do you ignore this evidence? And if the Israelites were the Hyksos, as Josephus says, then we have plenty of records of the Israelites in Egypt. Just track the history of the Hyksos. And it just so happens that the history of the Hyksos is the same as the Israelites. The Hyksos Exodus, for instance, is EXACTLY the same as the Israelite Exodus, in every respect bar the date. You seem not to have realised that Mt Sinai is the Great Pyramid of Giza. That is intimately linked to the number 40. Yes, indeed, Mt Sinai was the Great Pyramid. And this changes the route of the Exodus somewhat. The fact that you are considering that the whole ‘Pharaoh’ title was fabricated by ‘Manetho’ is quite interesting. And yes we could dig into that remote period of time, and try to find the true story behind this ‘Pharaoh’ deception. We will never know, only if we chose not to. If you are really a truth seeker/open minded try and read the book. whether its been fabricated by Manetho is the real question, you’ll never know. 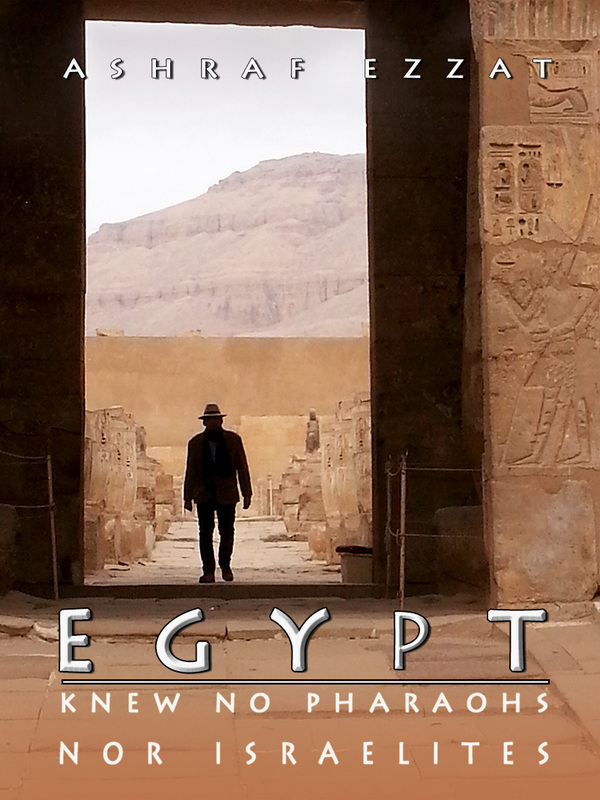 Pingback: Ashraf Ezzat’s new ebook “Egypt knew no Pharaohs nor Israelites” | What in the world is going on? Yes Clark I see your point. Actually In my book I revealed the Greek-Jewish conspiracy that had messed up with the Old Bible to control new territories like ancient Egypt and the whole Levant. Also I alluded to the Roman-Jewish complicity to manipulate the New Bible and control almost the whole ancient world. Tailoring and manipulating the faith of the Masses has always been the illuminati’s way to control them. Uneducated and gullible, as they have always been, the huddled Masses relentlessly cling to deception and subjugation. I believe you. Acttually jesus Christ never existed. The Zionist (Satan) created JC to form Christan Armies to fight the wars of Israel for at least 2,000+ years now. Now that the former USA does not exist any longer, China, Russia are now the favorites of Zionism. EVIL Zionism must be DESTROYED, NOW. We hear much about “evil zionazism” and the need to totally defeat and eliminate the problem. When shall we start the purge??? They are open targets of our crosshairs. Why are we the only ones being murder by zionazism’s orders and they escape with impunity??? They have murdered some of the best character having human being from amongst us because they stood against the evils of zionazism. They murder our soldiers and our civilians, yet they are never held accountable with justifiable punishment. What’s the problem with us that we tolerate this??? These evil zionazis Jews are the human embodiment of Satan, their father Rabbi operating from the “Synagogue of Satan” – the devils mansion. We are dealing with an entrenched mindset that has no intent of reform or stopping it’s plans for a “Jew world order” at the expense of who knows how many more Gentile lives. As “WORLD PUBLIC ENEMY NUMBER ONE”, they deserve ultimate punishment for all the death and destruction they have caused our world community for far, far, far to long. Our world community must execute a 21st century “DECLARATION OF INDEPENDENCE” from little king zionazis Jew – NOW! Yes, they have the Samson option, therefore, it’s best we clear the earth of all their leadership around the globe. Though they may murder near the entire human race, we must ensure the leaders do not escape. Our plan for taking out the evil head must be absolute and thorough. Case closed!